"In recognition of his distinguished teaching and for his contributions to the broad spectrum of thermodynamics of extractive metallurgy." John F. Elliott is professor of metallurgy at the Massachusetts Institute of Technology where he has been a member of the faculty since 1955. He received the degrees of bachelor of metallurgical engineering from the University of Minnesota in 1942 and doctor of science from M.I.T. in 1949. He was a John Simon Guggenheim Fellow at the Imperial College of London and the British Iron and Steel Research Association in 1965. Dr. Elliott publishes actively, often with his students as co-authors, in the areas of the chemical thermodynamics and kinetics of phases and reactions important in pyrometallurgical processes and high-temperature corrosion, iron and steelmaking, and process analysis. He is the co-author of two reference volumes on the thermochemistry of steelmaking. He has been active in many ways in AIME since his college years, joining the Institute in 1940. 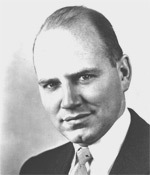 He received the Robert W. Hunt Award in 1954, the Open Hearth Conference Award in 1955 and the John Chipman Award and Charles W. Briggs Award in 1972. He was the Howe Memorial Lecturer in 1963 and the Extractive Metallurgy Division Lecturer in 1975. Dr. Elliott was elected a Fellow of The Metallurgical Society of AIME in 1968. He is a Fellow of the American Academy of Arts and Sciences and of the American Society for Metals and an honorary member of the Iron and Steel Institute of Japan. Dr. Elliott was elected a member of the National Academy of Engineering in 1975.